Westfield’s New Joy Lutheran Church Pastor Chris Duckworth has to meet physical standards for his role as chaplain in the U.S. Army National Guard, but he won’t carry a weapon when he’s deployed to the Middle East early next year. Duckworth joined the National Guard at age 39 and has never been deployed. Now 43, the Carmel resident is the only chaplain in his battalion of 500 soldiers. An armed soldier, known as a chaplain’s assistant, accompanies Duckworth because as a chaplain, he isn’t authorized to carry a weapon. By joining the National Guard, Duckworth fulfilled a longtime ambition of serving in the military. In high school, he wanted to follow his grandfather’s footsteps and join the Marines, but his mother forbade it. Now, he gets to serve his country ministering to soldiers’ spiritual and emotional needs. Several members of Duckworth’s congregation served in the Vietnam War. They have supported him and shared their details of their experiences. Because Duckworth is Lutheran, he isn’t well-versed in the traditions of other denomination or faiths, but he can support Muslim, Jewish and Christian soldiers in his own way. He provides religious support to soldiers regarding suicide prevention, emotional care and other non-secular support. Duckworth also a tends the needs of non-religious soldiers. Duckworth arrived at New Joy Lutheran Church in 2014, a month after he joined the Army. An intermittent pastor will serve the congregation during his one-year deployment. Duckworth’s wife, Jessicah, is an ordained Lutheran pastor and program director in the Religion Division at Lilly Endowment, Inc. She fully supports him in following his calling. 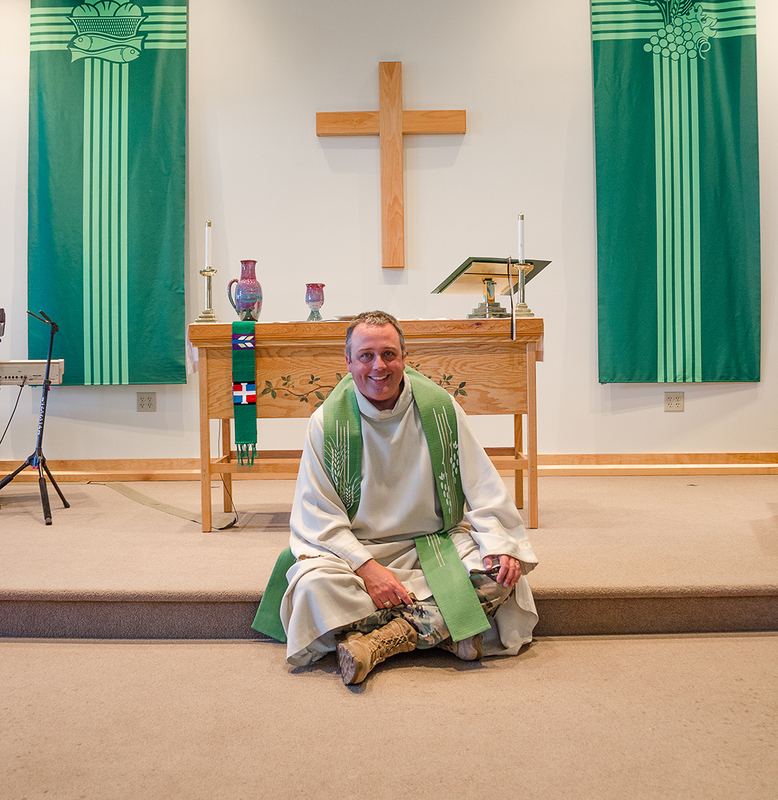 One weekend each month, New Joy Lutheran Church Pastor Chris Duckworth preaches while wearing his army fatigues under his Lutheran pastor robes. Combat boots protrude beneath the robes. He comes straight from his monthly training and doesn’t miss his church services. Early in his tenure as pastor, Duckworth spent three months away from the church to train as a chaplain with the National Guard. He spends two weeks during the summer at training in addition to his monthly weekends. “New Joy called me to be their pastor knowing I would be in the Army National Guard and supporting that call and realizing times there might be schedule conflicts, I might be pulled into training, that I would have this dual mission,” Duckworth said.